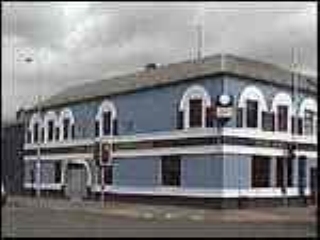 The Royal Bar is found on the corner of Donegall Road and Sandy Row. Have you got Google Earth on your computer? If so, then download the Google Earth view of The Royal Bar. Is this the wrong position for The Royal Bar? If you think so, then modify its position. Click / Tap the button above to get directions from where you are to The Royal Bar. feeling thirsty,entered the royal for a refreshment,noticed a person wearing a fendora hat.only one person that I know wears a fendora.introduced myself bearing a gift,a pint of guiness to mr Higgins,had photo taken with him,and also bar made a gift of a nice pint of lager to myself,nice touch.made so welcome.will be back. I visited Royal Bar on Sat August 1st on visit from Dublin during Republic's Bank Holiday. I had a very pleasant experience and was quite made to feel welcome. I was particularly chuffed to have been given the story by two kind gentlemen of Alex Higgins' association with the Royal as I had met Alex when he was in declining health. I really appreciated the atmosphere of welcome friendliness shown to me particularly by the lady collecting for the Dog's Trust. Thank u for such a good welcome to belfast. Very friendly pub. many thanks to sandra and the local crew for making me feel welcome. especially to jean and paul for accepting my gift to the late,great alex higgins. do hope it is seen as fitting of my respect to genius. see you all again someday i hope. andy. hull. east yorks. This top picture is of SANDY ROW RANGERS SUPPORTERS CLUB (The Old Clock Bar)! Royal is the smaller one across the street! BEST BAR ON THE PLANET LOVE IT. Called in by chance last sunday and what a day!!! the best bar in the world.staff really friendly.And the the guy singing all night(think his name was gary) could win x factor!! !really made my holiday, will be back soon.thanks john. Visit the Royal every year mid august always made welcome meet alex higgins in person in the royal sometime ago pub had a great refurbishment (mural to alex higgins covered the wall outside when last over well done)will be over in November this time can,t wait to hear "the Crack"
i was over visting billy betty only been in pub couple times ,baldy guy bought me drink thanks from me and my sisterinlaw lynn . Very nice place, really local. The owner was extremely friendly and helpful. A good place to just hangout. I visited the Royal Bar in Sandy Row one night last week. It was such a great experience, I ended up going back the following night instead of hunting out other pubs. The locals are the friendliest people I've met in a long time - maybe ever. It's a real gem of a place. I didn't want to catch my flight home on Monday - all because of the good time I was having with the locals. I'll definitely be going back to Belfast - just to visit the Royal Bar. went to belfast march 2010 was ther for the rugby and stayed in the hostel opp, went in to the royal on the sunday morning(10am) and was given the best welcome ever the owner, staff and locals are so welcoming, came back in the evening for the karoke and got to say had the best laugh ever, will go back 2moz if i could felt like my local..
came across this boozer while walking down the sandy row early saturday morning with 8 mates from grangemouth on lads beano top class pub and staff cheers to all at the royal.will be back soon. just a wee note to let boys of this fantastic wee bar il be back over for the twelth. I just want to say thank you to everyone at the royal for being so nice and looking after me. I came over from South Dakota in the USA for a funeral in Liverpool and was on my way back to the states when the ash clouds closed down all travel. I ended up staying at the hostel across the street from the Royal for what I thought would be a day but ended up being alot longer that I could have afforded. I went to the Royal and was made to feel welcome the minute I walked in. The proprietors, staff and local people were all beyond nice to a stranded "yank" as they all called me. By the third day I was out of money and had no idea what I was going to do but the folks at the Royal made sure I meals and even chipped in so I could stay at the hostel during my ordeal. I can never say thank you enough to everyone for your kindness and hospitality that you all showed to a stranger. I find it amazing that I had no plans of ever coming to this city and it ended being such a joyful experience through such a hard ordeal. Ya'll really showed me what irish hospitality really is. Im now lucky to have a bunch of new friends and hopefully ill be able to get back some time soon. Thanks again. Came all the way from Berlin for a tour of Northern Ireland and I ended up in South Belfast on my 4th day and just happened to wander into the Royal. What a cracker of a joint. The Owners took care of me like I was long lost family and I even got inducted into the Sandy Row wine team. By the way Lawrence your a great captain for the team. The staff if beyond spot on and the locals treat you like you grew up in the district. The women were lookers so fellas head on over Sunday for karaoke and maybe the big nosed fella will do a tune. Thanks to everyone at the Royal and hopefully I get back over soon. Cheers Mates. I have to agree with comments. I went into this bar and found everyone extremely friendly. I am a catholic from Donegal and was a bit concerned about being in there but one of the regulars got up and played 'The Boys of Killybegs come rolling home' on the juke box. I have to say some of the women looked a bit intimidating but I am sure they were as nice as the men. My husband and I were visiting Dublin a year and a holf on vacation and a friend of ours from Minnesota told we had to make the trip to Belfast to get a couple of pints at the Royal. Let me say that it was worth the train ride just to experience the wonderful atmosphere that the Royal and its patrons had to offer. The owner Cooper took great care of us and told us about all the history of the city and of Northern Ireland. The staff was very friendly and helpful and I have never felt so welcome at any bar in all my life. I hope everyone who has the chance to step into a Belfast bar chooses the Royal over any other. Just fantastic. The Karoke on Sunday afternoons is a HOOT.! Only popped in to watch a bit of live football, but could hardly leave the craic was so mighty. Started straight after the match, so there was no escape. As if I wanted to. Just had a brilliant weekend in Belfast, The royal is the friendliet and funniest pub I have ever been in. Top staff and locals who cant do enough for you. walk in and you will be welcome no matter where your from. Friendliest pub in all of Belfast!! I saw this bar and it looked interesting from the outside. I would love to go in and meet some of the locals but would be afraid I might not be made feel welcome because of where I'm from. Hidden gem of Belfast Bars. Visited The Royal after I read the comments on this site. Got curious. I have to say they are ALL TRUE! Never would have believed a wee bar in Randy Sow could be such fun. Never dreamt of going there before - and I live not far away. Good craic on Football nights. Women seem to be teated with respect. Customer Service at tha Royal is Tops. Great people and cheap drinks. Mates and I were over for match and stumbled into the royal and spent the whole weekend there. Newly remodeled bar and funny blokes. Stop in here for some laughs. I was over during the Summer with my Wife and 3 Daughters, and we were treated like Royalty, its a fabulous place to have a few beers and a blether with real Belfast people. We'll be stopping by the next time we're over in Belfast. Do yourself a favour and visit the Royal you wont be disappointed. Absolutely lovely people. I, accidentally, got stuck in the bathroom for five minutes and ended up getting free drink becuase of it! Unfortunately, it was the last place we came across before having to get back to the airport - otherwise, I know we would have ended up spending all night in there!